Campaign outreach, track initiative on matrix, logo on all workshop materials, newsletter, website, and brochure. We will also partner with you, promote your programs, attend meetings, make calls, etc on your behalf. Track initiative on matrix, logo on all workshop materials, newsletter, website, and brochure. In addition to the workshop materials, and the newsletter, your logo will be displayed and linked to our printed brochures and our website. Logo on all workshop materials, newsletter, and website. These funds will allow us to continue our mission of educating local government officials and city staff on local policies for increasing energy efficiency and reducing greenhouse gas emissions. In addition, to the workshop materials, your organization’s logo will be prominently displayed and linked to our monthly newsletter. Logo on materials for one workshop support. These funds will allow us to host one workshop for Local government officials and city staff. Your organization’s logo will be prominently displayed and linked to the workshop materials, including fact sheets for that workshop topic. 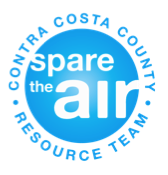 Donate to Contra Costa County Climate Leaders!